Do you want to outsource a part of your business processes but are wondering whether the job you have in mind can be outsourced? Are you unaware about which jobs can be outsourced? The answer to these questions is that almost any business process or work can be outsourced as long as data transfer is possible. One such location to whom almost any work can be outsourced is India. India has experienced professionals in almost every field. You can outsource your IT services and IT enabled services to India. There are outsourcing providers in India who also have efficiency in services that are not related to IT. What are the services that can be outsourced to India? Apart from this list, other services can also be outsourced to India. Almost any service can be outsourced to Outsource2india. 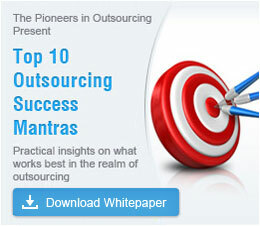 Why choose Outsource2india as your outsourcing provider? A much acclaimed outsourcing provider in India is Outsource2india (O2I). O2I is located in Bangalore, the silicon valley of India. At Outsource2india, we provide an entire range of technology-driven services that can give your organization a competitive advantage! Outsourcing to O2I can help you save on time, effort, manpower and infrastructure and at the same time give you access to skilled and professional services. Outsource to O2I and increase your revenue, productivity and delivery time. When you choose Outsource2india as your outsourcing partner, you can get access to a wide array of services. You will not have to spend time and energy getting different vendors for different services, as O2I is a one-stop destination for anything that you may wish to outsource. We have delivery centers located in India, Philippines, Kenya, Bolivia, US and Colombia. With our global delivery centers we provide services from the location which has the most efficiency in that particular service. This enables us to provide our customers with quality solutions at a cost-effective price. Choose O2I as your outsourcing partner and experience hassle-free outsourcing. A compilation of articles and white papers on outsourcing in general, and outsourcing to India in particular.